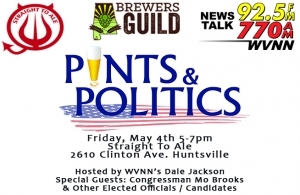 “Pints & Politics” – Friday, May 4th At Straight To Ale! 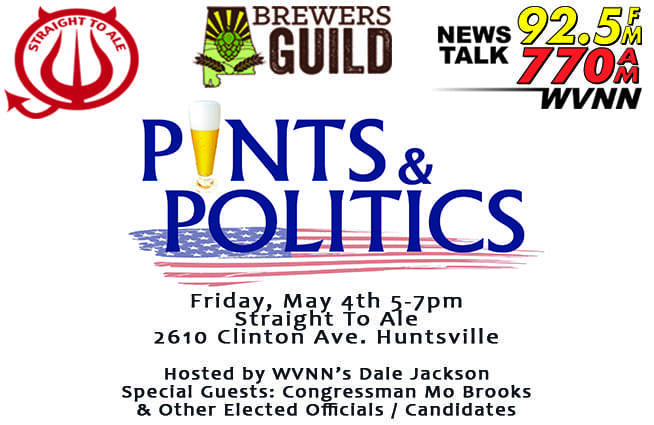 NewsTalk WVNN and The Alabama Brewers Guild invite you to a night of politics and public forum discussion at “Pints & Politics” – Friday, May 4th from 5-7pm at Straight To Ale (2610 Clinton Ave., Huntsville). WVNN’s Dale Jackson will serve as your host for the evening, and he is to be joined by special invited guest Congressman Mo Brooks and other elected officials and candidates. Come out, partake in a beverage or 2, meet your elected officials and those seeking office and enjoy a night of Pints & Politics with NewsTalk WVNN!